This was the first sunny day in weeks, and the first time I drove the Jeep on forest roads with the top down. I took Old Stage Road and Gold Camp Road west from Colorado Springs. The road is open, but pretty rough with potholes. My first stop was at the American Eagles Overlook near Victor. 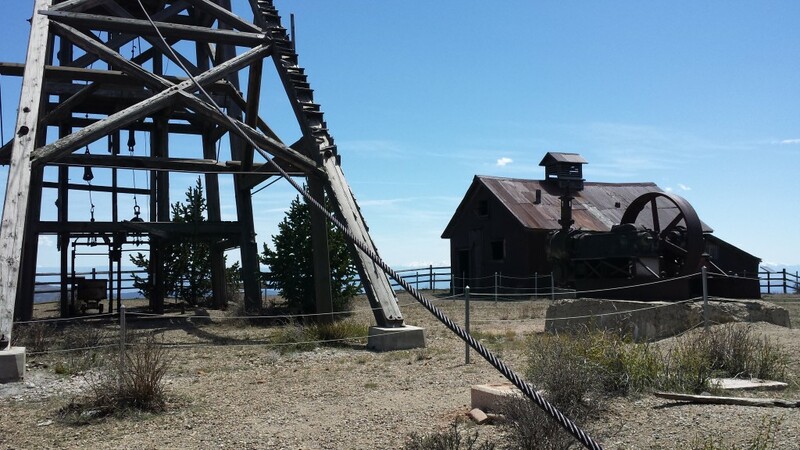 This site offers impressive views down into the fully-operational open-pit Cripple Creek & Victor Gold Mine, south to the Sangre de Cristo range, and west to the Collegiate Peaks. It is only a short walk from the parking area to the mine. Signage describes various aspects of the mining operations. Benches are placed to relax and enjoy the views. My second stop was just down road 831 at Vindicator Valley. This 2-mile loop passes by the remnants of several mines with interpretive signage. The parking lot has a port-a-potty and trail maps. The trail is well-marked with fencing. At the top of the trail, there is a short section that is closed, but one just needs to walk along the road to regain the trail on the other side of the closure. My third stop was in Victor, Colorado. I stopped in the “Alta Vista station” visitors center and chatted with a local resident who was there to welcome visitors. I learned that Goldfield is an incorporated town separate from Victor. And, the visitors center structure was a train station, relocated from the no-longer-existing town of Alta Vista in Phantom Canyon. It has restrooms and a grassy park adjacent. Finally, the Gold Camp Bakery Cafe & Deli on 3rd Street in Victor offers treats from a real German baker. I got a chicken pot pie for the road, and carrot cake and bee sting cake (Bienenstich) to take home. The town of Victor has many vacant storefronts; the bakery is a diamond in the rough.